The late 90’s to early 2000’s were a strange time to grow up. It was a major blitz of Japanese pop culture making its way into America. This included everything from Dragon Ball Z, to Sailor Moon, to Pokemon, and of course Digimon. That last one of course being a bit of an odd duck due to its being a counterpart of the Tamagotchi digital pets, but also being originally (and not entirely wrongly) perceived as a ripoff of Pokemon. Despite all that though, Digimon did thrive, came out with its own anime series, and like everything else during that time got a video game. The original game Digimon World was a fairly faithful translation of the virtual pet games into a 3D monster sim RPG. Barring some shared locations and character models, the sequel — Digimon World 2 — bore almost no resemblance to the first game. In shedding its roots, though, the end product for Digimon World 2 proved to be quite interesting. Digimon World 2 and its predecessor are like night and day. 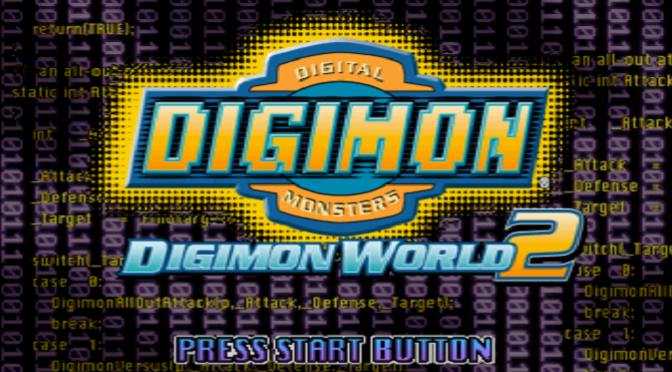 Where Digimon World was a monster sim RPG that more or less encouraged exploration of the world around it with your partner, Digimon World 2 is a dungeon crawler where you travel through randomly generated levels in a tank. The battle system is a fairly basic turn-based system, with your 3 Digimon taking on up to 3 enemy Digimon. The system for capturing Digimon is best described as a poor man’s Pokemon. The story isn’t much better, with a threadbare excuse for a plot where you save the world from the Digimon version of Team Rocket and an evil robot (I’m not sure how that last part factors in either). Despite all that, it’s still a bizarrely compelling game. Despite its very shoddy parts, what makes Digimon World 2 so compelling is more or less the collectible aspect. Like any other game of this sort, you just want to catch/collect them all. The hoops you have to jump through are myriad, however. From catching Digimon in dungeons, trading for them, “digivolving” them, and even DNA digivolving them. Unfortunately, like everything else in the game, much of how the mechanics work is left up in the air. That also applies to basic things like the combat system’s elemental weaknesses, the trinity of which types of Digimon can affect each other, and so forth. While that’s fairly typical of a game of this variety, it gives the game a bit of an artificial difficulty curve. All things considered, it’s stupefying to think how very little of the game comprehensively works in tandem, as at times it feels like the mechanics are at war with themselves. For instance, when randomly generated traps exceed your ability to copy with them early on in the game, it makes some dungeons seem almost unplayable. Also, the Digimon gifts that are used for recruitment sometimes simply don’t work, and no context or explanation is given. Digimon World 2 is very much the definition of a mixed bag. While it’s an entertaining game, it’s also deeply flawed — even by the standards of the time. While it’s easy to try to adjust your expectations for the fact that this game was released so long ago, this is not one of those times where gamers’ standards are too high. Sure, the game is compelling to play, but it’s difficult for me to recommend this title as one to seek out; especially since buying it is nearly impossible unless you find an original copy. In my opinion, this is one of those times where the barriers to enjoying a deeply flawed game are just too high. These are just my opinions, though. Let us know what you thought of Digimon World 2 by leaving us a comment down below, on Facebook, or on Twitter!